Use the value stored in your Breitling watch to raise a loan. 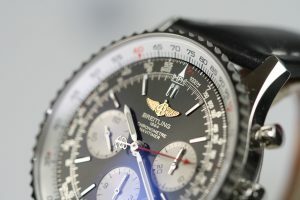 The quality of Breitling means that securing loans on Breitling watches is a straightforward task. It’s no surprise that people have faith in the Breitling brand – it’s been going since 1884. Founded by Léon Breitling, the Breitling watches are not only made in Switzerland but they are made using Swiss components. Breitling has a strong focus on highly technical watches, taking a leading part in the development of the modern wrist watch. What makes Breitling of particular interest to Hopkins & Jones, pawn-brokers in London, is the emphasis placed on Breitling’s role in the skies above us. Breitling include chronometer-certified movements within their watches. This is the ultimate recognition of the need for precision in time keeping. Breitling underlines their commitment to watch engineering as they are one of the very few brands that produces their own mechanical chronograph movements. Understanding every single element of the watch making process, Breitling has developed and built the movement in their own Swiss workshops and securing their name as one of the last remaining independent Swiss watch brands. For Breitling, creating stunning timepieces, such as the, Navitimer, Bentley, Superocean, Chronomat and Avenger, is only a part of their journey. Leon Breitling was driven by the need to make watches work harder and be more precise, which has had a huge impact in ways that are hard to imagine. Where would the world of athletics and sports be without Leon’s persistence in separating the stop/start functions from the resetting function. Patented, this innovation meant it was possible to add successive times without returning the hands to zero. This development has been critical in timing sports competitions and calculating flight times. While Breitling were busy changing what the wider world could do, it also brought about a great change for the everyday watch user. In 1969, Breitling launched the world’s first self-winding chronograph movement, putting an end to missed appointments and wrong watches. If you are a fan of engineering and technology, then Breitling perfectly encompass both worlds. Not content with offering smooth, sleek and dynamic timepieces, Breitling has never ceased to push forward on functionality. The Breitling Emergency is the first wristwatch in the world to host a personal locator beacon. Operating on a dual frequency, the Breitling Emergency is the saviour of aviators across the globe. The Emergency emits a radio transmitter that can reach up to 90 nautical miles (or 167km) – in flat terrain or calm seas- and can be picked up by rescue aircraft flying at 20,000 feet (6,000 m). It could be easy to dismiss the Emergency as a gimmick or gadget, but spare a thought for two British pilots, Squadron Leader Steve Brooks and Flight Lieutenant Hugh Quentin-Smith. In January 2003, the pair crashed their helicopter in Antarctica and were located and rescued when the search party identified their Breitling Emergency transmitter watches. The alternative is a chilling thought indeed! Why pawn you Breitling watch with Hopkins and Jones?